A discovery builds on existing research that suggests dinosaurs didn’t look like they do in Jurassic Park. 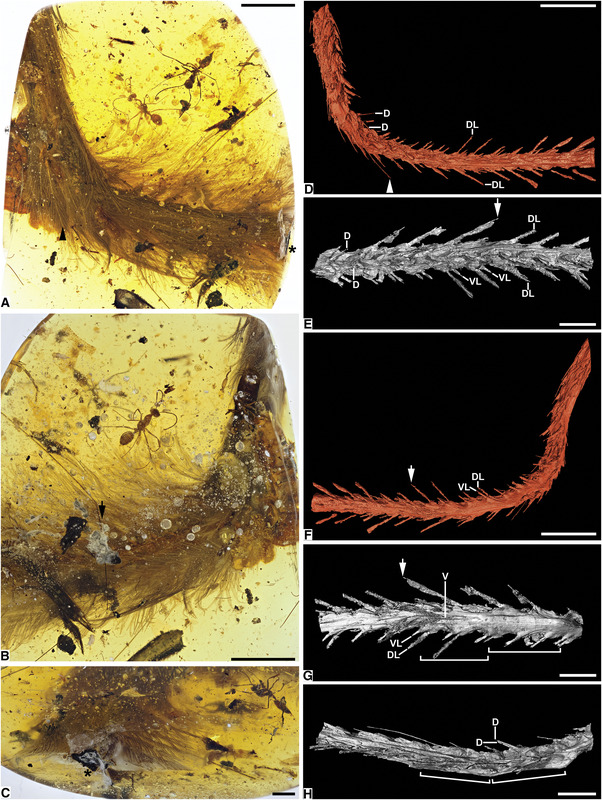 If researchers hadn’t snapped it up in time, the small chunk of amber with the dinosaur feathers inside would probably have been turned into a piece of jewelry. Paleontologists have discovered a piece of the tail of a 99-million-year-old dinosaur—complete with bones, soft tissue, and feathers—preserved in amber that was found in Kachin state, in northern Myanmar, according to a report published Thursday in the journal Current Biology. The tail, slightly curved with barbs jutting out, can be seen with the naked eye inside the fossilized tree resin. Most of the amber mined in the area is used to create jewelry, and this prehistoric sample had already been cut and shaped when it was collected by researchers, according to National Geographic. Check out some close-up shots of the sample here. The researchers, led by the paleontologist Lida Xing, of the China University of Geosciences, concluded the tail belonged to a young coelurosaur that lived during the Cretaceous period. Coelurosaurs are members of a group of theropod dinosaurs that encompasses tyrannosaurs and maniraptorans, the classification that includes the dinosaurs alive today—birds. The owner of this tail likely was not capable of flight, based on certain qualities of its structure, according to the researchers. The discovery builds on a stack of existing research that supports evidence for feathered dinosaurs. Feathery fossils have been found elsewhere in Myanmar, as well as in the United States, Canada, France, Japan, and Lebanon. Many are actually impressions of feathers in fossils, the real thing decomposed long ago. An actual fossil of feathers—plus what the researchers say are muscles, ligaments, and skin—well-preserved inside a handy disk of amber is a rare find. The evidence for feathered dinosaurs first emerged in 1996, when Chinese paleontologists discovered filament-like impressions in the fossils of Sinosauropteryx, a therapod with a long tail and tiny arms. Their work came three years after Steven Spielberg’s Jurassic Park had cemented in popular culture a particular idea of how dinosaurs looked—sleek, reptilian, and definitely featherless. In the years since, feathery fossils have contributed in part to the recalibration of dinosaur identity. Spielberg’s terrifying velociraptors prowling the kitchen for young kids? They probably had feathers, too.